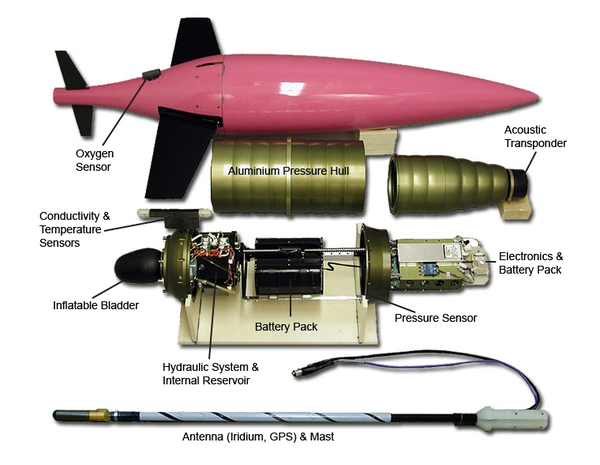 Gliders are unmanned, underwater vehicles (UUV) that can move through the ocean relatively autonomously for up to 10 months at a time, collecting scientific data down to depths of 1000m. The NorGliders project is a Norwegian research infrastructure project supported by the Norwegian Research Council and administered by the Geophysical Institute at the University of Bergen. NorGliders has currently 5 Seagliders from Kongsberg Maritime and 2 Slocum gliders from Teledyne Webb Research. These are operated by NorGliders and available for Norwegian marine research projects. Gliders have no propellers, but make progress by changing their buoyancy. Wings transfer some of the vertical motion into horizontal motion. A movable battery pack induce pitch and roll for turning. Internal compass, pitch and pressure sensors track the path trough the water, which is combined with GPS data on each surfacing to determine depth averaged currents. On the surface, new commands are downloaded, and scientific data transmitted. Scientists/pilots can communicate with the glider via satellite every time it surfaces. The glider can be programmed to visit a list of waypoints, loiter or keep a steady heading. It will continue doing what it is told to do until it is finished, a problem occurred or the pilot gives new instructions. Gliders are rather slow with maximum speed approx. 50 cm/s, but compensates with high endurance: They can be at sea for up to 10 months at a time before being recovered. Gliders can be equipped with a multitude of instruments measuring a wide range of parameters. The below list is not exhaustive. Sampling frequency can be set for each instrument, and for arbitrary depth intervals. Figure: Schematics of a Slocum glider. 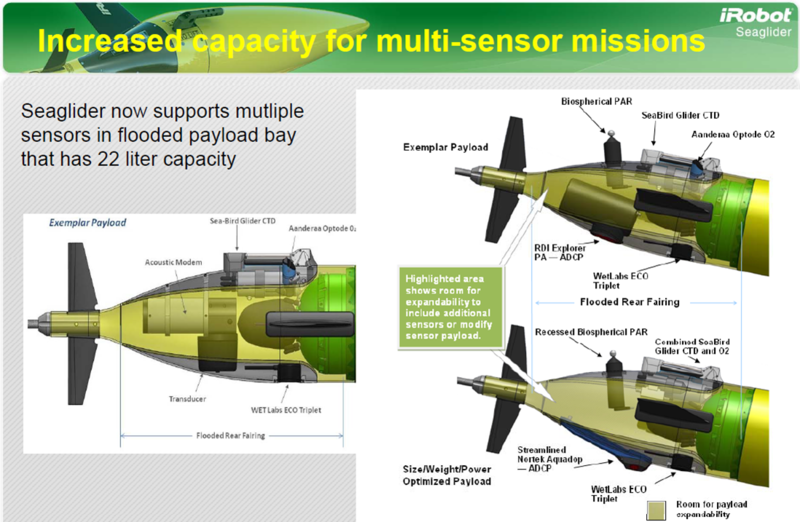 Figure: Some examples of sensor configurations on a Seaglider. Sensors can be fitted both on the in- and outside, or a combination of both. Multiple long term glider transects for the price of one short trip with a research ship. Continues to work in stormy conditions. Can be ordered to sample along a transect, keep a steady heading, stay at a virtual mooring or loiter at the bottom. Can be piloted from anywhere in the world with Internet connection. Each pilot can control several gliders. Can be used under ice (with acoustic comms), oil slicks or other obstacles. Can travel between moorings and calibrate instruments and/or pick up data and transmit via satellite. Extremely quiet and no vibrations. Does not disturb wildlife or sensors, and keep flow laminar over most of hull.